profit us only if they be pleasing to Thy goodness. Today’s Station is at St. Nicholas in Prison. It was constructed in the ruins of two temples and the ancient Forum Olitorium, and you can see fragments from them reused in the church. The most important of the temples was the Temple of Piety, built by Acilius Glabrius, consul in 191 B.C. The dedication to St. Nicholas was made by the Greek population in the area. The Collecta today is at the Church of St. Angelius “in piscibus.” The gathering of the faithful today was near the fish market; the church was in existence before the Eighth Century. The seven martyred sons of St. Symphorosa repose here. The Station is at St. Nicholas in Carcere. Over sixty churches were dedicated to St. Nicholas: this one stands near the ancient site of a public prison, and is built on the ruins of a pagan temple of Piety. This Saturday is called sitientes from the opening words of the Introit. Since the time of Pope Gelasius it has been a day for conferring Holy Orders, and was therefore once a day of great fast, extending through the night. The Gospel teaches us that if the house of God on earth is not to be turned into a house of traffickers – still less can we purchase our entrance into Heaven. We are to drink with joy from the fountains of grace which flow from the blessed Eucharist. The area in which the church of Saint Nicholas now stands was occupied in ancient times by three pagan temples dedicated to Ianus, Iuno Sospita, and Spes. The Forum Olitorium (a vegetable market) also stood here, not far from either the Tiber or the Theater of Marcellus. The church itself was built over one of these temples and incorporated within its walls parts of the other two temples. Its exterior is, as Georgina Masson describes it, “one of the most perfect examples of a Roman architectural palimpsest.” It is difficult to date the original structure; some think that it may be sixth century. It was believed for a while that the central temple was that of “Piety,” built by M. Acilius Glabrio, the duumvir, in 165 BC in fulfillment of a vow made by his father on the day of his victory over the forces of Antiochus the Great, king of Syria, at Thermopylae. Another identification makes it the site of the caritas Romana. It is said that there was a woman condemned to die of hunger in prison, but kept alive by being nourished by the milk of her own daughter. This tradition was certainly recalled when the Deaconry was established here, as Saint Nicholas is the patron of prisoners. 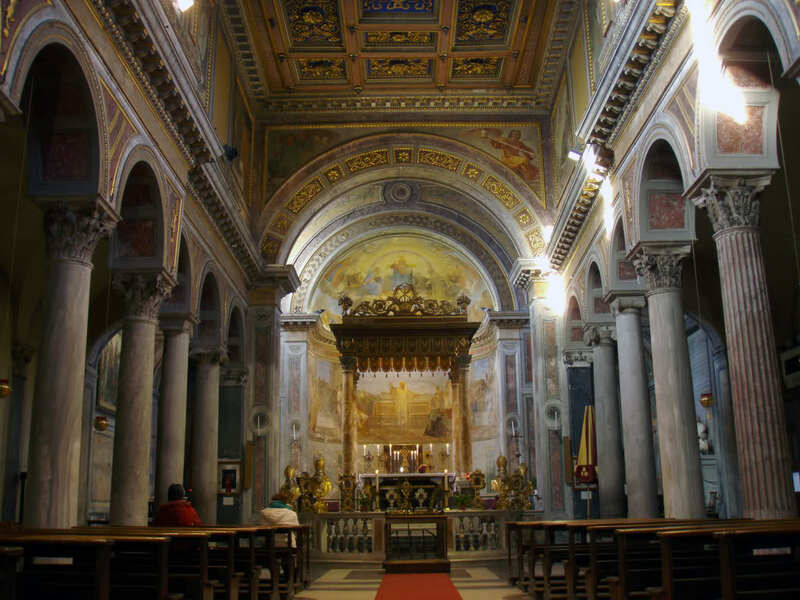 The entire church was remodeled by Giacomo della Porta in 1599 under the patronage of Cardinal Aldobrandini (later Pope Clement VIII), whose name is seen on the façade. The interior has fine antique columns taken from the pagan temples with diverse capitals. Below the altar, in the confessio, is a dark green porphyry urn containing the remains of Saints Marcellinus, Faustinus, Simplicius, and Beatrice. To the left of the apse is the chapel of St. Nicholas, and further on, the chapel of the Conception with its popular shrine to Our Lady of Guadalupe, a copy of the original given to the church by Jesuit missionaries after their expulsion from Mexico. Saint Nicholas also hosts the devotion to Our Lady of Pompeii, whose feast is on May 8th. From the sacristy, one can go down into the basement where there are many remains of the temple(s) on which the church stands. Sometime before the twelfth century, the Deaconry of Santi Nereo ed Alessio (which reverted to titular status) was transferred to that of San Nicola. In 1128 Honorius II erected the church as today’s station. San Nicola in Carcere still remains a Deaconry. However, in current times it belonged pro hac vice tituli presbyterialis to Patrick Cardinal O’Boyle, the former Archbishop of Washington, until his death in 1987. The church was intended to belong to Hans Urs Cardinal von Balthasar, who elevation to the College of Cardinals was announced in 1988 but who died before the public consistory of that year and therefore did not take possession of it. Location: On the Via del Teatro di Marcello, just south of the old theatre.